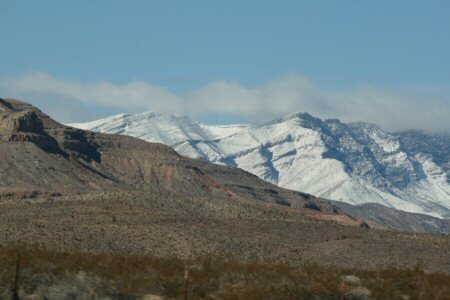 I don’t very often get to be a passenger on a drive through the desert, so I took the opportunity to grab some shots of the scenery today as we drove out to Primm for some bargain shopping. In particular, the Wrangler and Lee outlet store there is a regular source of awesome bargains. Really, how can you go wrong with five dollar jeans? Claire and I were cooing at the prices ringing up even cheaper than the label said. It’s not the first time that’s happened – there often seems to be some random discount taken off at the register on top of the stupidly low prices. But one pair still showed up as a whopping $18 so we were like "oh no, that’s so expensive". The cashier had never heard of sarcasm before so he pressed a couple of buttons and knocked another $3 off that too and asked us "is it cheap enough now?" while looking genuinely concerned that he might lose the sale. 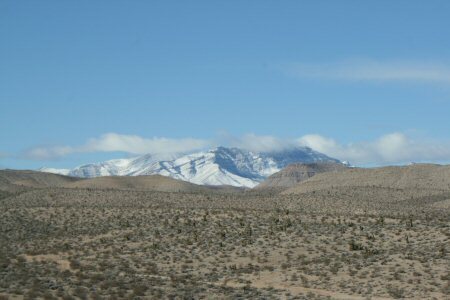 Anyway, there’s no snow left in the valley after last week’s freak weather and it’s getting noticably warmer, but the mountains still make it look like winter in the desert. Sounds like a laugh, if you get bored you can check your email ….